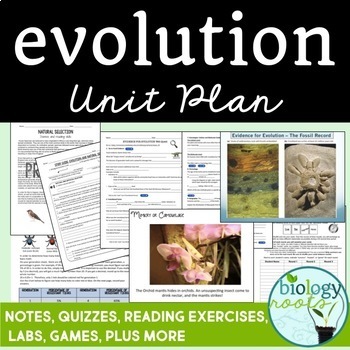 This NGSS aligned evolution unit plan takes your students on an adventure through evolution! From notes to the test, and all the fun stuff in between: reading exercises, labs, games, web quests, and more! 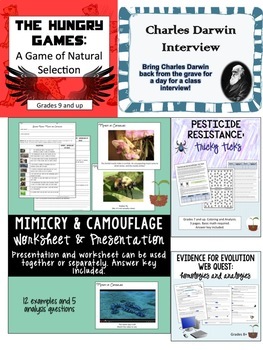 This unit can be used as a stand alone curriculum or as part of an existing curriculum. To buy everything separately, it would cost $46.92. I am offering this at over 30% discount for $31.99. Do you also incorporate interactive notebooks into your lessons? 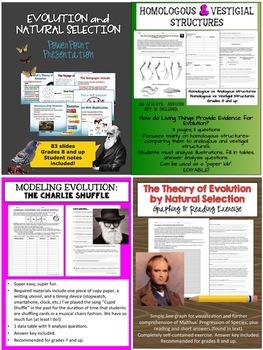 I offer an evolution and natural selection interactive notebook. 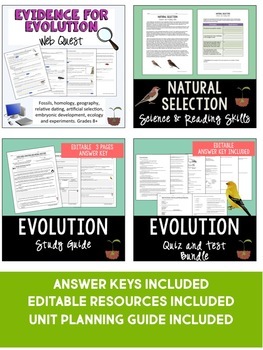 Or, you can check out this INB biology bundle, which includes the evolution INB plus 7 other sets for a discount! HS-LS4-1. Communicate scientific information that common ancestry and biological evolution are supported by multiple lines of empirical evidence, including molecular, anatomical, and developmental similarities inherited from a common ancestor (homologies), seen through fossils and laboratory and field observations. HS-LS4-2. Construct an explanation based on evidence that Darwin’s theory of evolution by natural selection occurs in a population when the following conditions are met: (a) more offspring are produced than can be supported by the environment, (b) there is heritable variation among individuals, and (c) some of these variations lead to differential fitness among individuals as some individuals are better able to compete for limited resources than others. HS-LS4-5. Evaluate models that demonstrate how changes in an environment may result in the evolution of a population of a given species, the emergence of new species over generations, or the extinction of other species due to the processes of genetic drift, gene flow, mutation, and natural selection. For single classroom only; not to be shared publicly (do not create publicly accessible links). Copying for more than one teacher, classroom, department, school, or district is prohibited. Failure to comply is a violation of the DMCA (Digital Millennium Copyright Act).